what to do to prepare ourselves, "to conceal ourselves"? 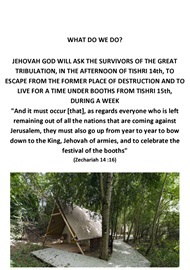 What do we do BEFORE, DURING and AFTER the Great Tribulation? 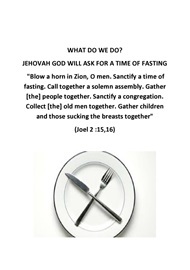 This first part will be based on spiritual preparation BEFORE the Great Tribulation. 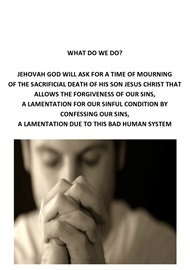 While the slide show, will be based on spiritual preparation, DURING and AFTER the Great Tribulation. "And everyone who calls on the name of Jehovah will be saved"
Jesus Christ pointed out, the most important commandment: The love for Jehovah God: "He said to him: “‘You must love Jehovah your God with your whole heart and with your whole soul and with your whole mind.’ This is the greatest and first commandment" (Matthew 22: 37,38). 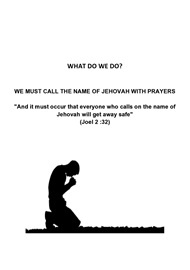 The love for God, is to recognize that He has a Name: Jehovah (YHWH) (Matthew 6: 9 "let your name be sanctified"). "Also, when you pray, do not act like the hypocrites, for they like to pray standing in the synagogues and on the corners of the main streets to be seen by men. Truly I say to you, they have their reward in full. But when you pray, go into your private room and, after shutting your door, pray to your Father who is in secret. Then your Father who looks on in secret will repay you. When praying, do not say the same things over and over again as the people of the nations do, for they imagine they will get a hearing for their use of many words. So do not be like them, for your Father knows what you need even before you ask him. “For if you forgive men their trespasses, your heavenly Father will also forgive you; whereas if you do not forgive men their trespasses, neither will your Father forgive your trespasses" (Matthew 6: 5-15). 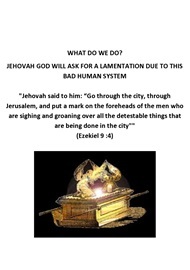 Jehovah God wants us to have an EXCLUSIVE relationship with Him, that is, He does not want us to pray another "god": "No; but I say that what the nations sacrifice, they sacrifice to demons and not to God; and I do not want you to become sharers with the demons. You cannot be drinking the cup of Jehovah and the cup of demons; you cannot be partaking of “the table of Jehovah” and the table of demons. 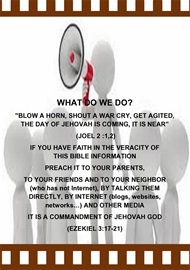 Or ‘are we inciting Jehovah to jealousy’? We are not stronger than he is, are we?” (1 Corinthians 10: 20-22). The second important commandment, according to Jesus Christ, is that we must love our neighbor: "The second, like it, is this: ‘You must love your neighbor as yourself.’ On these two commandments the whole Law hangs, and the Prophets" To these two commandments all the law is suspended, as well as the Prophets" (Matthew 22: 39,40) and " By this all will know that you are my disciples—if you have love among yourselves" (John 13:35). The love for God is through the love for our neighbor: Whoever does not love has not come to know God, because God is love" (1 John 4: 8) (The sacred life). If we love God, we will seek to please Him through good conduct: "He has told you, O man, what is good. And what is Jehovah requiring of you? Only to exercise justice, to cherish loyalty, And to walk in modesty with your God!" (Micah 6:8). If we love God, we will avoid a conduct that He disapproves: "Or do you not know that unrighteous people will not inherit God’s Kingdom? Do not be misled. Those who are sexually immoral, idolaters, adulterers, men who submit to homosexual acts, men who practice homosexuality, 10 thieves, greedy people, drunkards, revilers, and extortioners will not inherit God’s Kingdom" (1 Corinthians 6: 9 , 10). The love for God is to recognize that He has a Son, Jesus Christ. 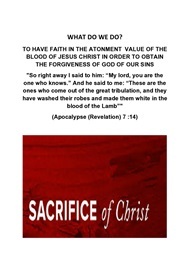 We must love him and have faith in his Sacrifice which allows the forgiveness of our sins by God. Jesus Christ is the only path to everlasting life and God wants us to recognize Him: "Jesus said to him: “I am the way and the truth and the life. No one comes to the Father except through me" and "This means everlasting life, their coming to know you, the only true God, and the one whom you sent, Jesus Christ" (John 14:6; 17:3). The love for God is to recognize that He is guiding us through His Word the Bible. 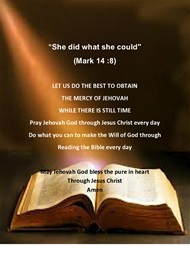 We must read it every day to know better God and his Son Jesus Christ. The Bible is our guide that God has given to us: "Your word is a lamp to my foot, And a light for my path" (Psalms 119: 105). A Bible Online is available on the site and some Bible references to better enjoy his advice (Matthew chapters 5-7: The sermon on the Mount, the book of Psalms, Proverbs, the four Gospels Matthew, Mark, Luke and John and many other biblical passages (2 Timothy 3: 16,17)). 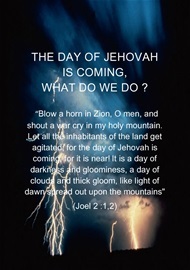 If you want, you can see the slide show (by clicking on the first picture), to find out what Jehovah God will require us, DURING and AFTER the Great Tribulation. If you have any questions, or would like additional information, you can contact the site or the site's Twitter account. May God bless the pure hearts through His Son Jesus Christ. Amen (John 13:10).